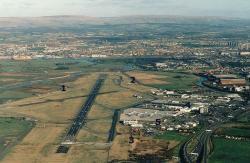 Glasgow International Airport is eight miles from Glasgow City Centre and saw it’s first commercial flight in 1966, passenger numbers have risen since then, to 8.7 million in 2007. There are links to and from the Airport either by Buses that operate from several routes, and the Glasgow Flyer that runs 24 hours from Glasgow City Centre, or by Rail, the nearest station is Gilmour Street just two miles from the Airport and easily connects with buses and taxis for the short onward journey. For passengers who wish to drive, the roads are well signposted, the Airport is just north of the M8 Motorway at Junction 28. On arrival there is the option of short and long stay car parks, or there is always the choice of park and stay offered by many hotels in the area, or perhaps Valet Parking is the answer…….. Once inside the Terminal Building the Check In Desks are on the ground floor, and a covered walkway links to the smaller T2 area where further check in Desks also operate depending on the airline being used, trolleys are available throughout the Terminal. There is a choice of shopping on offer from Newsagents and pharmacy to the tempting perfumes, spirits and gifts available in the Tax and Duty Free outlets. The Food Village has variety of restaurants, and there are Cafes and Bars, many of whom offer highchairs and children’s menus. The Information Desk is situated on the first floor and also offers photocopying and faxing service if required. Disabled travellers have designated parking areas, specially adapted toilets, Mini Com and Induction Loops for the hard of hearing. The Executive Lounge has comfy surroundings with complimentary drinks and snacks, and for smaller passengers there are plenty of Baby Changing facilities and a play area to enjoy.